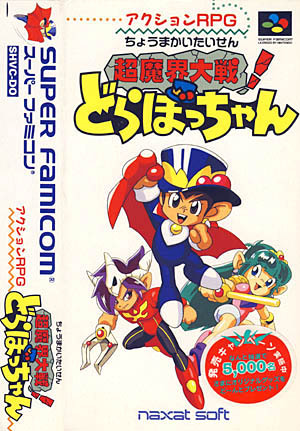 Chō Makai Taisen: Dorabocchan is a cute and unique Role Playing/Adventure game by Red and Naxat Soft. 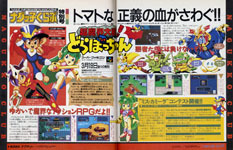 It is the sequel of another cute action game originally released for the tiny PC Engine. It features Dorabō, a young vampire, who's on a mission to save his world from a dastardly invasion at the hands of an unscrupulous zombie army. Several kingdoms located on a group of islands have been ruled for centuries by their powerful kings. They all lived in harmony with each other until one of the king, Dorakiraya (Von Hesler), became greedy and sent his army of zombies to conquer the rest of the world. Kamîra (Camelia), the cute daughter of queen Banparera (Vampra), managed to escape and began to look for Dorabō, son of king Oowarusa (Dracuman). But our heroes will quickly realize that something evil controls Von Hesler... Dorabō's main weapons are his cape and his hat. Those can be upgraded during the game, from simple throwing and spinning attacks, to spectacular bolts of lightning. And, unlike the first episode of the series, he can now also use magic cards and collect experience points and gold from downed enemies. Those cards can be purchased in shops (or found on defeated enemies) and come in various forms, such as Healing Cards, Fire Cards, Teleport Cards or invisibility Cards. Interestingly, Dorabō's life is symbolized by Tomatoes (I guess tomato juice represents blood, this is a game for children after all) and a large tomato is awarded for each new experience level gained. During the game, our friend will often be followed by a partner. This second player can attack enemies but can't be injured, and will often be stopped by parts of the scenery. 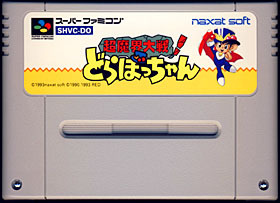 Chō Makai Taisen: Dorabocchan is an adventure/RPG obviously aimed to a young audience. Graphics are cartoony, colorful and very good for the most part. However, the whole game is very linear and the story doesn't really evolve beyond the introduction sequence. Do not expect here an intense RPG, but rather a nice and unique action/adventure game. You won't find any side quests or extra features, and visited areas can't really be explored again which greatly limit the game's replay value. But, overall, this title works really well, with smooth controls and excellent gameplay. It also has a nice learning curve making it not too difficult nor too easy. All in all, Chō Makai Taisen: Dorabocchan is an innovative, solid and fun game.